Madilyn is a 1 1/2 year old beautiful black female born October 4, 2016. Her sire is CTW Pipe Down and her dam is MRL Goin Bye Bye. Madilyn is part of a litter of six and was the only one that was not individually registered. She decided early on to skip the racing circuit and head straight for an adoptive family! Madilyn and her mom, Bye arrived together to the GALT family. It has not been determined yet if Madilyn is small animal or cat tolerant. Welcome to our newest Black Beauty, Madilyn. 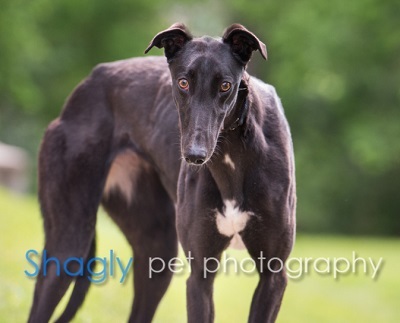 Madilyn is a young, quiet girl who is a wonderful leash walker and very gentle during human interaction. Her shiny coat is stunning in the sun and she is eager to follow and please. Definitely on the submissive side, she should easily meld with an existing pack. Daughter to our recent addition, Bye, she inherited her excellent manners and calm demeanor from mamma!